New to the equipment range for 2015 this gutting machine makes offal removal easy and quick. The nozzle draws up any fluids within the cavity of the bird thus eliminating the need to wash the bird out after the removal process. Create vent in bird manually. Insert suction piece through vent with suction off. This is done with one hand movement on suction piece. Once in, move hand to suction position and with other hand rotate bird around suction piece. Withdraw bird from suction piece. With processing of game birds, all innards/fat and organs are removed except for lungs. For chickens/turkeys/ducks, gizzards would have to be ‘drawn’ whole or sucked out manually. 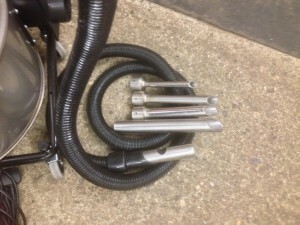 For lung removal we would advise the use of the small suction piece supplied. Cleaning of this unit is simple and quick. This would be achieved by placing the suction piece in to hot soapy water and drawing solution up the pipes into a collection tank. Emptying of the collection tank is easy. The tank can either be wheeled to an emptying point or the tank can be removed off the main frame and emptied else where. The tank is fitted with a 100 mm sluice vent for emptying. 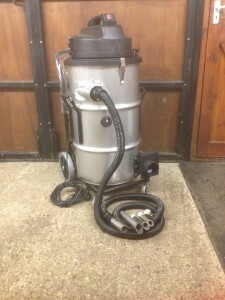 This can be fitted with a 1 metre flexipipe to aid emptying. For operator comfort we would suggest the suction unit be housed away from the area of work. This is easily done by bringing the suction pipe through a wall thus creating a less cluttered work space. As with any piece of equipment whether it be a plucking machine or other- The speed of the operation is determined by practice and also the operators technique. In this video we are demonstrating the ability of this unit. Suction unit manufactured and adapted for this application by Numatic. Stainless steel collection vessel. 80 litre capacity. Complete with ‘sluice’ emptying and large bore plastic pipe. Collection vessel mounted on four wheeled frame for transportation, would dismount if required. Flexible, smooth bore suction pipe, 3 metres in length. 4 suction nozzles- 36mm, 30mm, 19mm, 14mm diameter. Crafted in stainless steel complete with hose mounting boss. Suction created by 2 electric motors, 2500 watt, 240 volt. Prices quoted are excluding VAT & carriage. Please contact us for any further information on this product.